AMD’s upcoming Fusion line of chips will combine a GPU and a CPU in the same processor package. Unlike Intel's current Core i3 and i5 CPUs which do this, AMD isn't just bundling two discrete pieces of silicon on one package - they're going to be completely integrated. This is much like the move AMD took when developing its first quad-core CPUs: while Intel was satisfied with bolting two dual-core CPU dies together in one processor package, AMD wanted a more elegant design. This perfectionism arguably cost the company. The first Phenoms were dogged by months of delays before their release, and when they finally arrived they suffered from bugs (Translation Lookup Buffer errata, anyone?) and very poor clock scaling. Meanwhile Intel hoovered up the market with Core 2 Quads that did the job just fine. In a recent chat with AMD, its engineers were at pains to tell us that Fusion isn’t a case of history repeating – Intel may have been first to launch a CPU with an integrated GPU in the Clarkdale Core i3 and Core i5 series, but Fusion features Radeon graphics and an updated execution core CPU. The first two types of Fusion CPU will be far more than just Phenom IIs with a GPU grafted on. So significant a change is Fusion that AMD insists on calling Fusion processors APUs – Accelerated Processing Units - rather than CPUs. Fusion CPUs will also be the first to use GlobalFoundaries' 32nm, high-K plus metal gate manufacturing process. This should make them faster, more overclockable and less power-hungry than current Phenom II CPUs, and possibly reduce their price too. 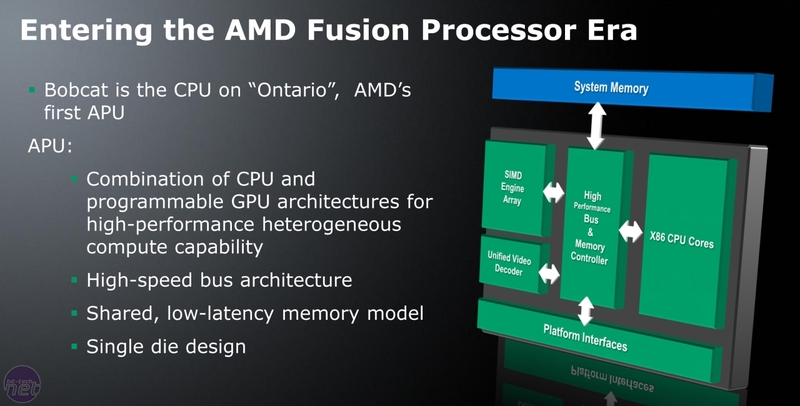 There will be three types of Fusion APU, but AMD was only keen to talk about two of them. You'll found out why soon enough. Click to enlarge. There will be three types of Fusion CPU, all of which will be on sale next year (2011). One APU architecture family, Ontario, will target ultraportable laptops, and the first version will be based around the Bobcat core design. Meanwhile, Bulldozer APUs will be designed for servers, workstations and other High-Performance Computing systems. The third version of the Fusion APU doesn’t, we believe, have a publicly known name, though we do know that the first core design (rather than the architecture itself) is codenamed Llano. As Bobcat is slated to be the first APU released, let’s start with that. The Bobcat core design is named so because it’s meant to be as agile and feisty as its namesake. 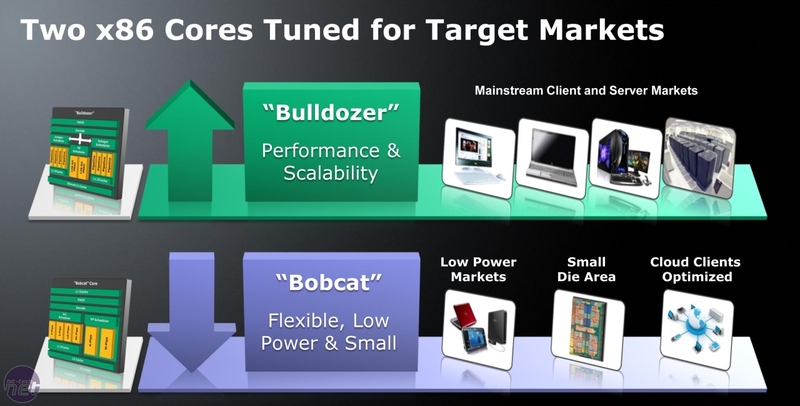 Bobcat is the family name for the ultra-portable APU range, the first CPU of which is codenamed Ontario, and is ‘ahead of schedule’ with AMD stating that it’ll ‘value-ramp Ontario before the end of the year’ – expect Bobcat products in ‘early 2011’. The highlights of the architecture are its potential sub-1W power draw (when loaded) and full out-of-order execution. AMD's Bobcat APU, derived from the Ontario architecture, looks every bit as fierce as its namesake. Click to enlarge. AMD estimates that a Bobcat CPU will have ‘90 per cent of today’s mainstream performance in less than half of the silicon area’. Even if you define ‘mainstream performance’ in the meanest way and equate it to Intel’s Atom, that opens a huge market for AMD in smartphones and tablets. Get more generous with your ‘mainstream’ definition and you’re looking at a CULV-killer. 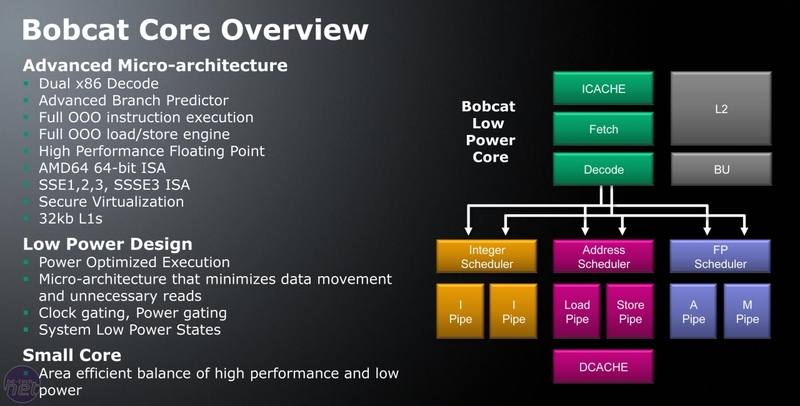 A Bobcat APU is designed to be power efficient, with AMD implementing the power-gating (as well as clock-gating) that we first saw in Intel’s Nehalem architecture. AMD’s implementation is likely different, but it didn’t tell us much more about this improvement. It was keen to point out that power efficiency wasn’t gained at a loss of speed though, with dual x86 decode paths per core, an advanced branch predictor and a high-performance floating point unit. Could we see Bobcat phones, smart-tellies and tablet PCs? AMD wouldn't say, but it's a possibility. Click to enlarge. 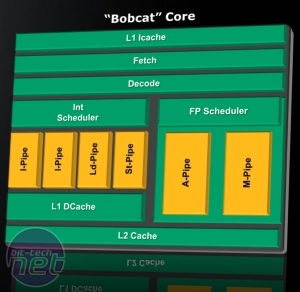 However, AMD did mention Intel’s Atom much more than its Core i3 or Core i5 CPUs when talking about the Bobcat design – statements such as Bobcat having ‘a distinct advantage over Atom’ and so forth. 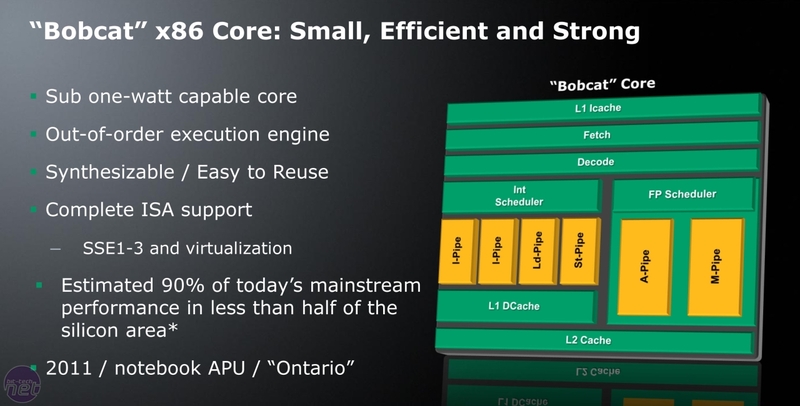 We’ll have to see if Bobcat APUs will replace the Neo CPUs in 13in laptops, though AMD did talk about this type of device in relation to Bobcat. When asked whether we’d see Bobcat APUs in other devices AMD evasively replied that it could "extrapolate the technology to many use, targeting netbook and notebook." It won’t be drawn on whether we’d see Bobcat tablet, media players, smart-tellies or mobile phones at all.